Which of the cars has the smallest engine capacity? It’s not a trick question. But over 75 percent of 15 year-old school children in Indonesia do not have the mathematical skills to answer it correctly. Every three years, Indonesia’s education system goes through the ritual humiliation of the PISA tests, comparing the performance of 15 year-olds in 65 countries in reading, maths and science. Indonesia has more teachers per student than most much richer countries, and an amendment to the constitution guarantees that 20 percent of the national budget is spent on education. And yet the 2012 PISA results, released this week, show that Indonesia ranked at the bottom of the heap in maths and science, and did only marginally better in reading. A full 42% of 15 year-old Indonesians in school don’t reach the lowest defined level for maths, meaning they can’t “perform actions that are almost always obvious, and follow immediately from given stimuli”. Three out of four do not reach level 2 in maths, meaning that they are not capable of making literal interpretations of the results of simply presented data, such as reading values off a bar chart. Just 0.3% of Indonesian students managed to score at level 5, the second highest grade, compared with 55% in Shanghai. Here’s the full table of results (xls),in alphabetical order, though it’s easier to find Indonesia if you look at the ranked chart below, because you just have to go straight to the bottom. 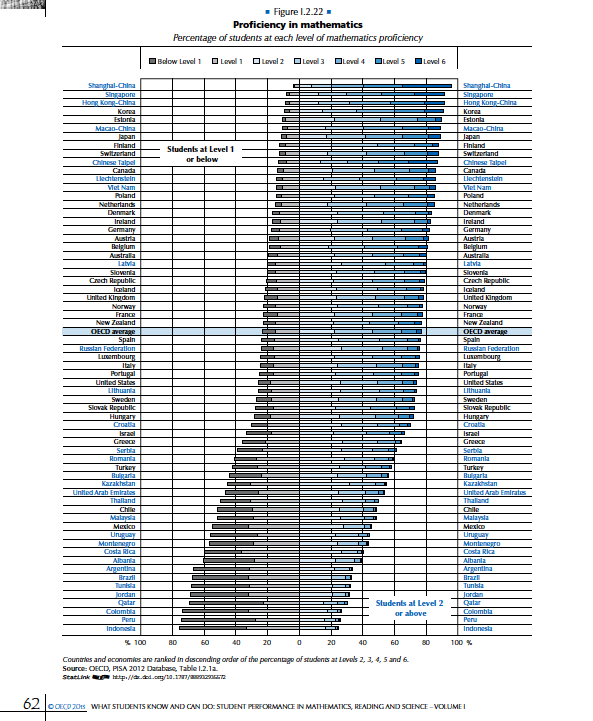 In science, a quarter of Indonesian students did not reach the bottom level of proficiency, and a further 42% were mired at level 1 (for those who can’t do the maths, that means two out of three kids are unable to draw conclusions based on simple investigations — full excel table here). Though every other country that was at Indonesia’s dismal level in the 2009 round has pulled its socks up significantly, the performance of Indonesian students in science has actually fallen since three years ago. We can’t yet blame this on the new policy, instituted recently by all those well-educated people in the Ministry of Education, to remove science from the primary school curriculum. No Indonesian managed to score at level 5 in science. In reading, they are doing better. A whole 45% of students have managed to demonstrate “a baseline level of proficiency… that will enable them to participate effectively and productively in life” (though of course that leaves over half that have not attained this dizzy goal). Level 5 was reached by 0.1% (full excel table here). Not one Indonesian student managed to reach the highest level, level 6, in any of the three test subjects. 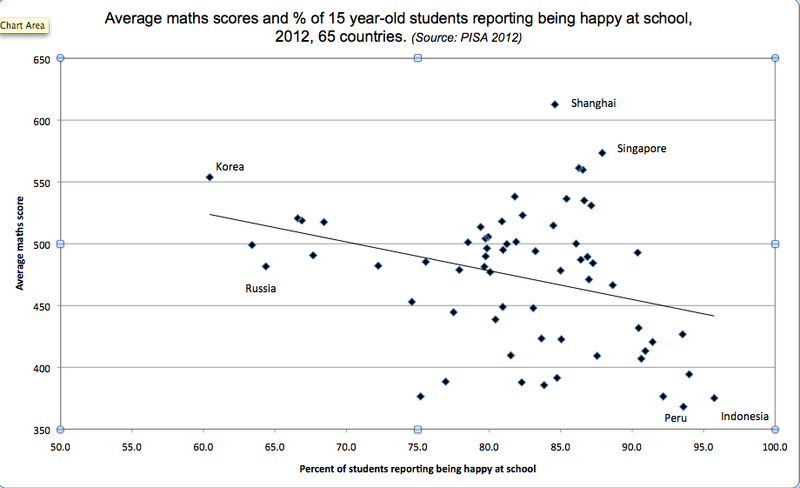 It does seem that in general, less competent kids feel happier in school. And there’s nothing wrong with being happy. But it worries me that Indonesian children do not even realise how badly the school system is failing them. Though the overwhelming majority have not, by the age of 15, acquired even the basic skills needed to function in modern society, they think they’re all set for the future. Some 95% report that they have learned things that have prepared them for their future jobs, and almost three quarters think that school has prepared them adequately for adult life. Fewer than one in ten think that school has been a waste of time. Which makes me wonder what kind of future Indonesia will have. Edit: January 8th, 2014 – This post received many, many comments. Comments on this site are closed. This post is reproduced at http://www.indonesiaetc.com/indonesian-kids-dont-know-how-stupid-they-are. You can see all the old comments there. You can also leave a new comment about this post (in English or Indonesian) over there.